If you follow us on social media you will no doubt already know that I did an oopsie and got an ouchie! For those of you scratching your heads I’ll explain. Last Friday I was happily walking my dog with not a care in the world when I had a little fall. Well quite a big flop actually. We had taken our normal route along the beautiful country road where we live and were almost done when it happened. I was half way up the garden path heading back indoors and suddenly I was flat on my face on the ground. It took a minute for it to register, then I started to feel pain in my right wrist which made getting up off the ground a little tricky, so I sat there for what seemed ages but it was probably less than 2 minutes. All this time Cooper my golden labrador was standing there wagging his tail at me, he was wondering why we had stopped no doubt. Then I really started to feel the pain in my right wrist, as well as my right knee and right shoulder and thought uh oh I’ve hurt myself a fair bit here…sugar plum fairies…or words to that effect came out of my mouth. Maybe slightly bluer…you can use your imagination at this point. Mr DC was still at work at this time so I rang him to tell him what I’d done. I could wiggle my fingers and still move my wrist, although it hurt quite a bit…insert more blue language here…so I figured at least I hadn’t done too much damage and didn’t think it was broken, it was more likely to be a bad sprain. 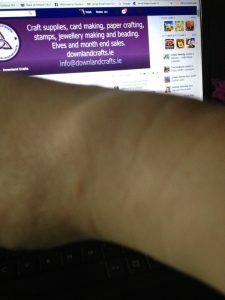 As you can imagine it started to swell and I got a nice lump appearing on my wrist so I quickly added some ice, as you do, to help. I had lots of helpful advice from the #DownlandCrafters ladies when I put this pic up in our Facebook group. 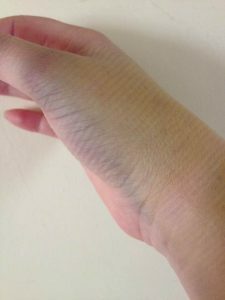 The lump soon dispersed into a more even layer of protective swelling all over my hand and wrist making my knuckles almost dissapear. A few days later after many ibuprofen tablets and lots of strapping, I started to develop a beautiful bruise as you can see below. 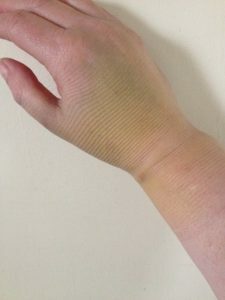 As someone who hardly ever bruises I was quite impressed with all the pretty colours. At this stage our Elfie started calling me unicorn elf…lol. In true crafter style the colours have developed even further and there is a lot more yellow involved but at least the swelling has almost subsided making movement a lot easier. It looks like I’ve had the ink pads out! I can now type properly again but sadly not quite up to crafting yet. I have lots of card making and jewellery making projects planned but they will have to wait. Hopefully it won’t be much longer. In the meantime I’m dreaming up lots of new stamp ideas to bring to you as soon as I am back to my normal self.